Our third webinar in the Collaborative Product Launch is right on schedule. After we gathered some potential products to private label, and chose the product based on actual sales data we are now digging into finding the right supplier. And the timing coincidentally worked out quite well, as Greg has been busy meeting suppliers (and burning lots of calories) walking around the Canton Fair. If you haven’t checked out his notes on the experience of being in Guangzhou and the Fair, you definitely should. Exhausting and exhilarating just reading about it. While it is obviously an advantage to source a product while at the fair, it is in no way a requisite, and this is Greg’s first time there despite having dozens of products currently selling on Amazon. It does help though in expediting the process for the purpose of this collaborative launch, and it is an interesting perspective to share, how a negotiation may differ whether conducted in person or initiated via Alibaba like so many of us have to do. Greg emailed 14 suppliers on 10/22. You can see his exact template for reaching out to suppliers at a previous blog post here. 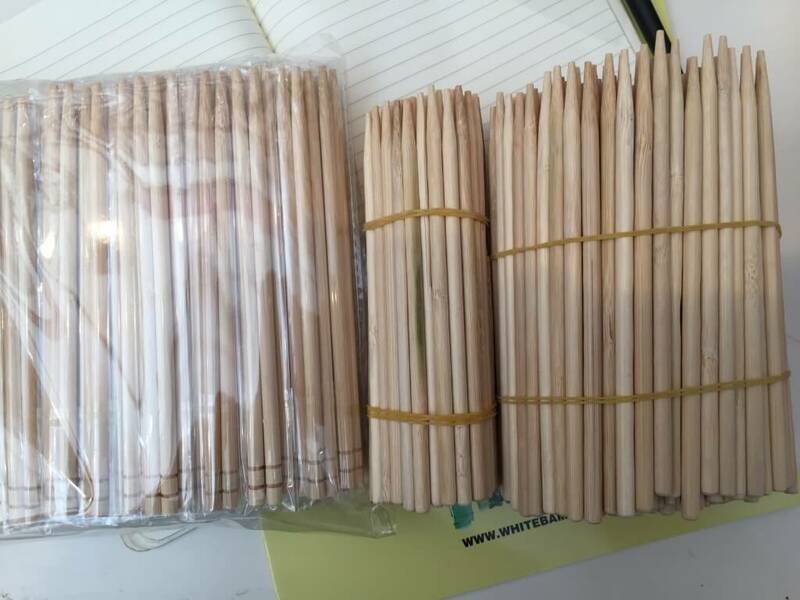 Once you see a potential match for the product (in our case, food grade long bamboo marshmallow sticks, just click the “Contact Supplier” button and drop in your email template. Do not judge a company by the Response Rate of their profile. The response rate is determined by how often they respond to an inquiry within the Alibaba platform. If they respond directly via email, but are responsive and timely, it would not count towards their Alibaba Response Rate. It is hard to determine which listings are an actual manufacturer as opposed to a sales agent or middleman. Ultimately, it does not really matter what their job title and relationship to the product is, as long as you are working with a reliable, trustworthy organization that gets you the product and price you need. If a supplier asks more about your company background and details, it is likely a supplier to larger companies that is vetting your buying power before investing time and resources to the sales process. Assuming someone in the early stages of their private label business, it is unlikely they pass the vetting process, so easier just to move on to other potential suppliers at this point. Greg prefers to quickly move a conversation outside of the Alibaba platform, opting for Skype or email. For him, a matter of efficiency and ease-of-use. This is an example of an email response from a supplier–not necessarily the best reply however pretty typical of a lot of them. After a quick exchange, he sent the samples and sent a follow up email confirming that the sample had in fact arrived at the hotel in Guangzhou. Regardless of what specifications you have for the product you choose to private label, include as many details as possible in your initial outreach. It shows your thoroughness and professionalism, as well as streamlining any back and forth communication to clarify the exact product you want. We had several suppliers respond that they could do something similar but not meet all the criteria laid out initially, which made it easy to move on to other suppliers who could meet our needs. The questions laid out in the template simply make it as easy as possible to vet potential suppliers based on first impressions and replies. In addition to simply being helpful information to assess how viable a supplier will be, it is an evaluation of their communication and organizational skills. Will the supplier be easy to work with going forward? The way that a supplier responds to these questions will be a good reflection of that. What is the cost of this product per unit including shipping via Air Express to the United States zip code 20861? Out of the 14 suppliers initially emailed on 10/22, we have engaged in at least an email exchange with 12 of those, and proceeded to order samples from 5 of the suppliers. 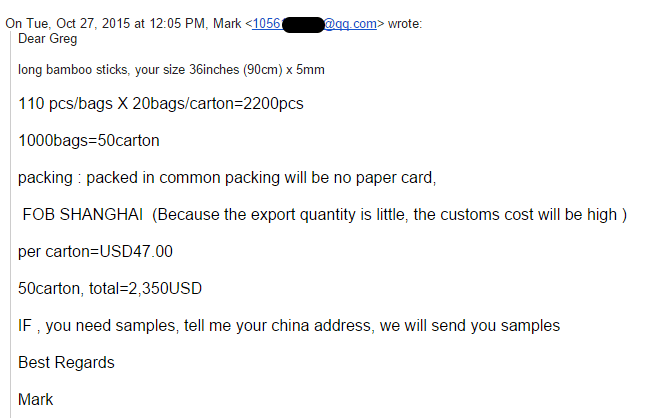 While in the US, you should be fully prepared to pay $50-$100 to procure samples from China within 3-5 days, all of that going towards express air shipping from China to the US. A nice added bonus of Greg being in China while ordering samples is a completely sample product sent to his hotel completely free of charge. Maybe I’ve been in America for too long, but not much comes completely free of charge with no strings attached, so that’s a nice little bonus! In Greg’s template to suppliers, he asked if they would take Paypal for the entire first order. Greg’s recommendation, especially for first-time private label sellers, is to use Paypal for the first payment. The reason is simply it allows for some insurance in case there is something wrong with the product or order, you can file a dispute if you do not get the items as expected. However, Paypal is not necessarily a desirable payment option for Chinese suppliers, as there are high associated fees (which may be paid for by the buyer anyway), and it is a longer process to receive the cash. So if a supplier does not accept Paypal for the actual order, it does not mean that they are not legitimate. In fact, larger factories used to interacting with high volume orders deal with mainly wire transfers, or T/T as it is often referred. So is there any way to protect yourself if you pay via wire transfer? Using an escrow service or Alibaba Trade Assurance is an option, but not one that Greg has ever used at this point. The fact is, once a T/T transfer has been executed, the transaction is complete and there is no recourse for recovering the money for whatever reason. Though it is a tad bit early to dive deep into the negotiations, price negotiations are the important next step once a good supplier is found. Simply put, you do not want to order any product if the pricing will not work out to leave you enough profit margin. In that ball park calculation, you will need to consider what the “landed cost” of your product to the Amazon warehouses will be—that includes the cost of goods sold, the shipping costs, customs, taxes, etc. On top of the landed cost, you will have to account for the various Amazon FBA fees. Ultimately, the goal is to hit a 100% return on your investment, so that your profit at least matches the sum total of the cost of the product, shipping to Amazon warehouses, and FBA fees. 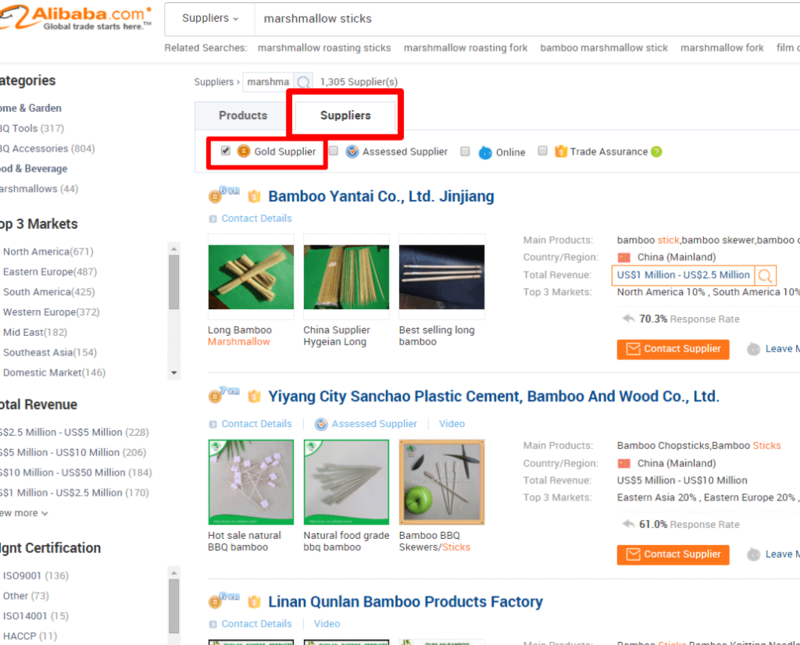 A look at Jungle Scout’s FBA Profit Calculator makes this more easy to understand, and you will see that our bamboo marshmallow sticks, if landed at the warehouses for less than $8.00, yield more than a 100% ROI. But back to negotiating price…..if you make an initial outreach to a bunch of suppliers, it becomes evident what the “market” rate for any given product is, assuming you have a few quotes to compare. You really only want to follow up with those that are realistic, to save time from the outset. One important tenet that Greg follows here is to not get too caught up in a nickel-and-dime game here, squeezing the supplier too hard to come down on price. He figures that in the end, a mutually beneficial relationship that can sustain for the long-term is more valuable than making a nominal amount more per sale. So where do we go now? After Greg receives the samples, we will gauge the quality of product and interactions with the suppliers. And the negotiations will commence based on the samples! As it may be hard to differentiate and create a brand around a product like bamboo marshmallow sticks, we will try to find a nice packaging solution. Ideally we’ll find something that will be environmentally friendly and well-designed. Thank you to the chat room in the live webinar for suggesting a bamboo or linen sack, or recycled cardboard box. We will look for those options. Regardless, we will post photos of the samples and the quoted prices. So hopefully the samples will arrive next week, the week of November 2nd, and we can choose the best supplier and get into production by the following week. Stay tuned to the blog for updates, and of course register for the webinar so you can join us live as we discuss the rest of the supplier negotiations and beginning production. Find more products to source with the Web App and Chrome Extension! For those who could not join the fun at the Canton Fair, the Jungle Scout meetup in Guangzhou was a blast. 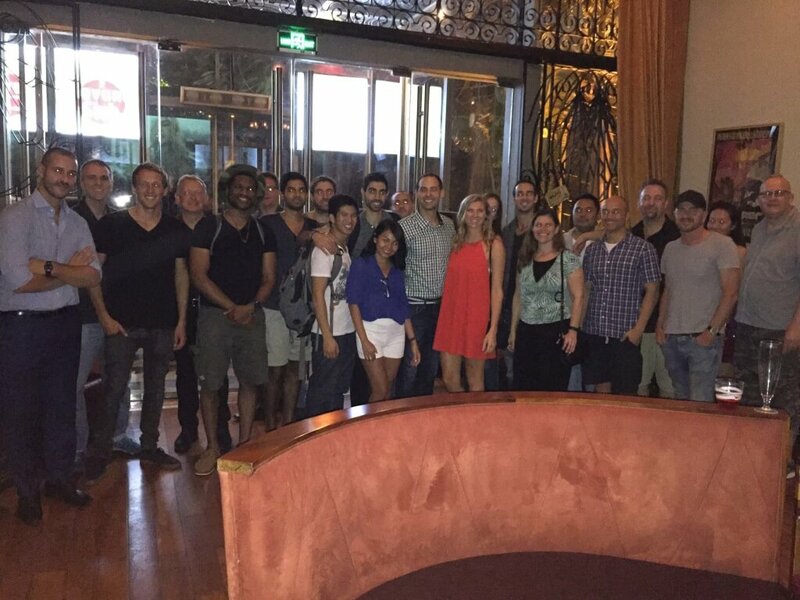 Thanks to all for coming out to join the meetup, it was a great turnout and great to meet the community face to face. 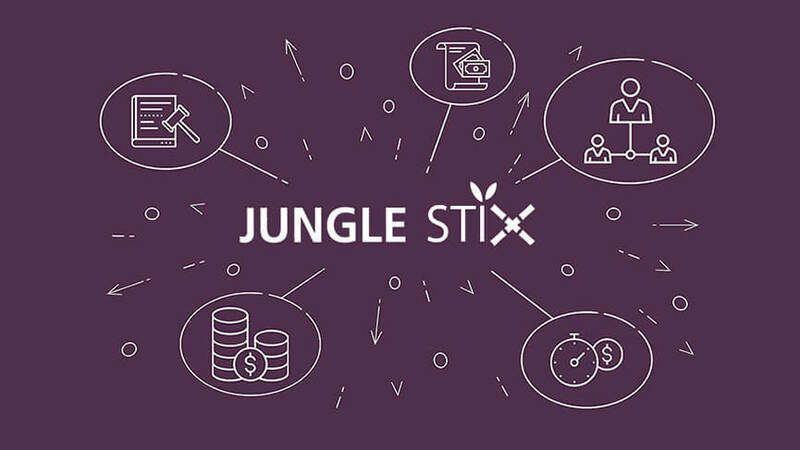 Jungle Scout certainly is a unique community of collaborative and intelligent ecommerce entrepreneurs! Amazon picks for you when you do your fulfillment order. Was the last webinar airing on Nov11 session 4? When will that be posted on the site? Keep up the good work guys. I would like to comment and ask some questions but do not currently use social media. Is there an email address that I can correspond with you or Greg on? Absolutely, please email [email protected] and we’ll take care of you asap.